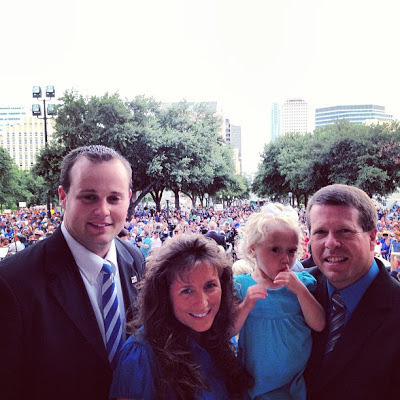 If you live near Austin, Texas, join the Duggars on the South Steps of the Texas State Capitol tonight at 7:00 PM CST for a pro-life rally. Jim Bob and Michelle Duggar will speak, and Josh and Josie Duggar will also be present. Participants are encouraged to wear blue. This Texan would like to thank you for coming to the rally. I think Michelle was the best speaker! God bless you for standing for LIFE! The rally was amazing! I was really hoping to get a picture with the Duggars!!! Great cause..Nice to see them supporting and helping their son. They are busy people, they must have went from one venue to the next. They have the same outfit on! I think the pro-life stand the Duggars are taking is so wonderful!! May God bless them as they continue to serve Him. I have a thought for Josh. Your in the public eye now and you have to dress nice. So why does Anna still have to wear used clothes? Someone else's cast offs. New clothes don't have to be expensive. And Anna deserves new. And please some decent shoes. It is a great boost to a persons self confidence.